USNS Amelia Earhart (T-AKE-6), a Lewis and Clark-class dry cargo ship is the only ship of the United States Navy to be named for noted American aviation pioneer and women's rights advocate Amelia Earhart (1897–1937). 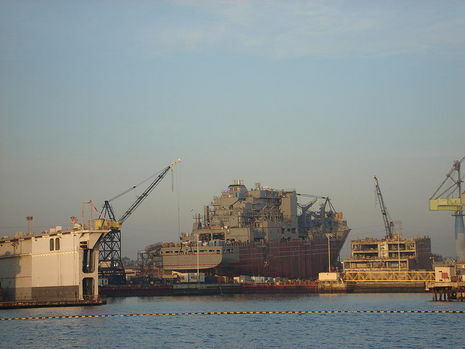 The contract to build the ship was awarded to National Steel and Shipbuilding Company (NASSCO) of San Diego, California, on 27 January 2004. Her keel was laid down at the end of May, 2007 at General Dynamics' NASSCO shipyard. In early 2007, Dr. Alex Mandel, PhD. along with members of the Amelia Earhart Society (AES) and Amelia Earhart Research Association (AERA) successfully petitioned the naming of the ship. On 26 July 2007 one of the ship's four 200-ton diesel-electric engines toppled from a truck delivering it to the shipyard in the 2700 block of Harbor Drive, San Diego. The engine damaged three vehicles, completely flattening one. A woman sleeping in the back of a van whose front-end was destroyed suffered minor injuries. The accident also created an eight foot deep sink-hole in the roadway and ruptured a water main. The accident is believed to have been caused when the truck accidentally delivered the engine to the wrong gate of the shipyard and hit the curb while backing up in an attempt to turn around. The engine was recovered on 29 July by three heavy cranes. At 9 p.m. 6 April 2008, a ceremony was held to christen the Amelia Earhart with the honors of breaking the traditional bottle of champagne given to Amelia Earhart's niece, Amy Kleppner. The new ship is designed to deliver ammunition, food, fuel and other dry cargo to US and allied warships at sea. It will be crewed by 124 civil service mariners and, at times, will include an additional compliment of military personnel and carry two helicopters. 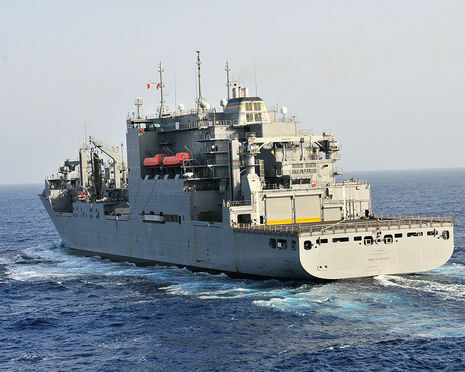 USNS Amelia Earhart is one of Military Sealift Command's eight Dry Cargo/Ammunition Ships and is part of the 41 ships in Military Sealift Command's Naval Fleet Auxiliary Force. The Navy will launch and christen the USNS Amelia Earhart at a 9 p.m. PDT ceremony on April 6, 2008. 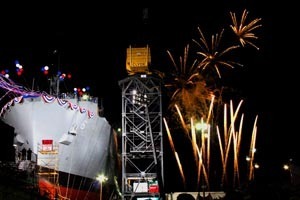 The christening ceremony for the newest ship in the Lewis and Clark (T-AKE) class of underway replenishment ships will be held at the General Dynamics NASSCO shipyard in San Diego. Designated as T-AKE 6, the new ship honors aviation pioneer Amelia Mary Earhart for her courage, vision and groundbreaking achievements, both in aviation and for women. Earhart's name became a household word in 1932 when she became the first woman -- and second person -- to fly solo across the Atlantic, flying from Harbor Grace, Newfoundland, to Londonderry, Ireland. That year, she received the Distinguished Flying Cross from the U.S. Congress, the Cross of Knight of the Legion of Honor from the French government, and the Gold Medal of the National Geographic Society from President Herbert Hoover. In January 1935, Earhart became the first person to fly solo across the Pacific Ocean from Honolulu to Oakland, Calif. Later that year she soloed from Los Angeles to Mexico City and back to Newark, N.J. In July 1936, Earhart took delivery of a Lockheed 10E "Electra," financed by Purdue University, and started planning her around-the-world flight. The USNS Amelia Earhart is the sixth ship in the Navy’s 11-ship T-AKE class. The ship will directly contribute to the ability of the Navy to maintain a worldwide forward presence by delivering ammunition, food, fuel, and other dry cargo to U.S. and allied ships at sea. The ship is designed to operate independently for extended periods at sea and can carry and support two helicopters to conduct vertical replenishment. As part of Military Sealift Command’s (MSC) Naval Fleet Auxiliary Force,the USNS Amelia Earhart is designated as a United States Naval Ship (USNS) and will be crewed by 124 civil service mariners working for Military Sealift Command’s. The ship will also have a military detachment of 11 U.S. Navy sailors to provide supply coordination. One previous ship has been named for Earhart. The SS Amelia Earhart was a Liberty ship built in the U.S. during World War II.